Amy is the mother of four children, two boys and two girls, ages 8, 6, 2 and 9 months, and lives in Massachusetts. The kids get up at 6:30 and I ignore/pretend morning isn’t coming for as long as I can. Sometimes I get a half an hour. NO…and they don’t usually. Once we wrestle them down they usually stay. 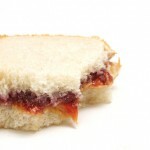 PB and J. IZZZZZ there anything else? Dessert…the rest is just fodder. Currently Facebook but before that Craig’s List. To Portland, OR for my 20th HS reunion. A WHOLE LOT..or I’d never get anything done! Hours and hours really, truly. I like The View…but I never watch TV in the morning. I channel surf. I do think about going back. I have a five year plan to either go back to work, or get a masters. Teach OR work admin/admission for a private school so my kids could go. PB crackers….the whole family unit would come down around my ears. I use them for fast breakfast, I use them for snacks in the car. I use them with fruit for lunch. When the kids say ‘do we have pb crackers?’ if my answer is ‘no’, things go straight to hell. I hide in the bathroom for it for cry’n out loud! What’s the most recent memorable comment one of your children made? I said to my eldest son about a year ago, “Wear your helmet.” He asked “Why?” and I answered “Because the pavement is hard and you are beautiful.” He fired back “So are you.” SLAM! And he is right! That I loved them…that I wasn’t perfect but I gave it my all. I want them to look back and feel I was IN it. I love this woman; she is a realist.